used that you do not understand, ask someone to explain it or look it up in the manuals and publications available to you. Steelworkers are required to lay out and fabricate steel plate and structural steel members. Assignments you can expect to be tasked with include pipe layout and fabrication projects of the type required on a tank farm project. 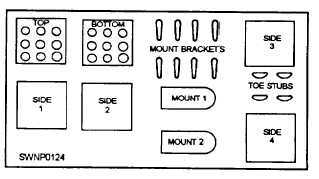 Plate layout procedures are similar to those for sheet metal (see chapter 2). There are some procedures of plate fabrication however, that are fundamentally different, and they are described in this chapter. Steelworkers are also tasked to construct and install piping systems designed to carry large quantities of liquids for long distances. Steel plate is much thicker than sheet steel and is more difficult to work with and form into the desired shapes. Before fabricating anything with steel, you must take into consideration certain factors and ensure they have been planned for. First, ensure adequate lighting is available to enable you to see the small marks you will be scratching on the steel. Second, ensure all tools you need are available and accessible at the work area. Also, ensure you have an accurate field sketch or shop drawing of the item to be fabricated. When laying out steel plate, you should have the following tools: an adequate scale, such as a combination square with a square head, an accurate protractor, a set of dividers, a prick punch, a center punch, and a ball peen hammer. When layout marks are made on steel, you must use a wire brush to clean them and remove the residue with a brush or rag. Then paint the surface with a colored marking compound. Aerosol spray is very good because it allows the paint to fall only in the areas to be laid out and also because it produces a thin coat of paint that will not chip or peel off when lines are being scribed. When appropriate, the layout lines can be drawn on steel with a soapstone marker or a similar device. However, remember that the markings of many of these drawing devices can burn off under an oxygas flame as well or be blown away by the force of oxygen from the cutting torch. These conditions are undesirable and can ruin an entire fabrication job. If using soapstone or a similar marker is your only option, be sure to use a punch and a ball peen hammer to make marks along the cut lines. By "connecting the dots," you can ensure accuracy. 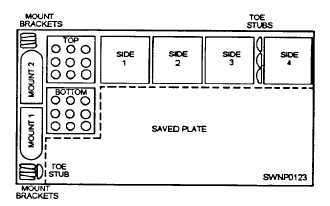 Plan material usage before starting the layout on a plate. An example of proper plate layout and material usage is shown in figure 3-30. Observe the material used for the cooling box. It will take up slightly more than half of the plate. The rest of the material can then be used for another job. This is only one example, but the idea is to conserve materials. An example of poor layout is shown in figure 3-31. The entire plate is used up for this one product, wasting material, increasing the cost and layout time of the job. The layout person must have a straight line or straightedge that he or she refers all measurements to. This straightedge or line can be one edge of the work that has been finished straight; or it can be an outside straight line fastened to the work, such as a straightedge clamped to the work. Once the reference line has been established, you can proceed with the layout using the procedures described in chapter 2. Figure 3-30. - Proper plate steel cooling box layout. Figure 3-31. - Improper plate steel cooling box layout.